A cable car takes nature lovers in five minutes from Adliswil to Felsenegg, a view point on the Albis mountain range. It is one of Zürich’s most popular recreation areas and at 800 meters, you have a breathtaking view over Lake Zürich, the small towns lining the shores and the towering, snow-capped mountains in the distance. Numerous walking and hiking trails as well as a restaurant on the summit serve as an escape from the hectic everyday life. From Uetliberg for example, the Planetenweg, a planet trail that reflects the distances in the solar system, leads to Felsenegg. Every meter of the path corresponds with one million kilometers in space and the two-hour walk takes hikers from the sun past planets – little metal spheres embedded in boulders - all the way to Pluto. Just 20 meters from where Pluto can be found, the bright red Restaurant Felsenegg awaits, where you can get a drink on the patio and enjoy the view over the Sihl Valley, Türler Lake and the Säuliamt district. While the views are spectacular during the day, don’t hesitate to visit at night either, when the sprawling city of Zürich can be seen spreading out as a sea of light in the darkness. 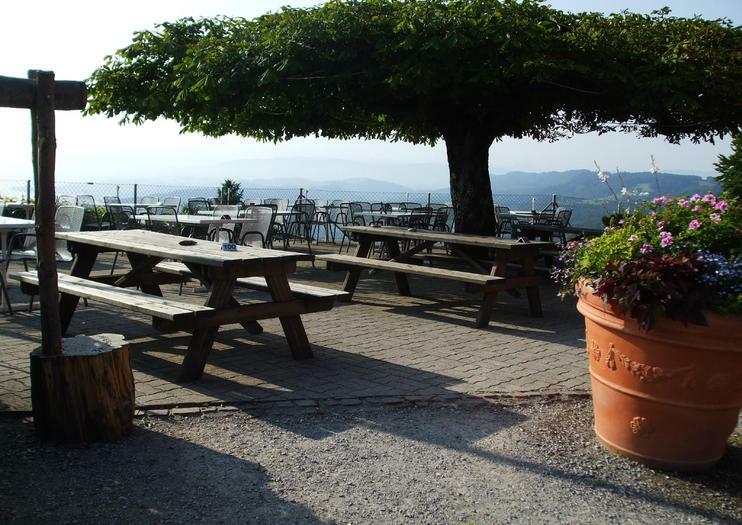 It is very easy to get from Zürich to the Felsenegg lookout point. First, take the S4 train for 15 minutes to Adliswil, from where signs guide the short way to the cable car station. The cable car runs every day from 8:05am to 9:50pm in summer and from 9:05am to 8:05pm in winter. Gain a new perspective on Zürich on a small-group excursion that includes a ferry ride across Lake Zürich, a cable car journey, and a tour of the Old Town. Visit landmarks including Lindenhof and Grossmünster, gaining insight into the city’s history and culture from your local guide. Discover the spectacular sights of Zurich on a 2- or 4-hour private tour of the cultural Swiss city. Admire legendary landmarks and historical monuments like the Bahnhofstrasse and the charming Old Town while enriching your knowledge of the region’s rich history. See the Swiss Federal Institute of Technology, the place Albert Einstein imparted his wisdom; browse the exhibits within the Swiss National Museum; and take a tranquil cruise on the shimmering surface of Lake Zurich. Customize the itinerary of this private tour according to your interests and receive the undivided attention of your personal guide.